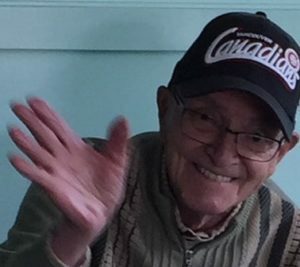 Thomas George Thomson of Kamloops, British Columbia passed away after a short illness on February 6, 2019 at the age of 95. He was born in Brooks, Alberta on October 11, 1923. Thomas is survived by his loving wife Hilda, daughters Carol-Ann (Jim) and Brenda. He will be lovingly remembered by his grandchildren Amy (Luke), Reid (Chelsea). There will be many stories told to great granddaughter Lucy. He worked for 40 years for the Canadian National Railway. Thomas in his younger days served in the Navy in World War II. Thomas was an avid golfer and fisherman. There will be no service at this time. A Celebration of Life will be held in the spring. We’d like to send special thanks to NP Natalie Manhart and all of the amazing nurses and volunteers at Hospice. In lieu of flowers we would request donations to Marjorie Willoughby Snowden Hospice Home in Kamloops, please. Dear Linda &Family I am sorry to hear about your loss. Take care of yourselves during this difficult time.Love to all. My heartfelt condolences to you and your loved ones on the passing of Mr Thomson. I will always remember him with fondness from our days living as neighbours on the cul de sac in Prince George and later on my visits to your house in Kamloops.